Spanning 53,000 square feet, this top notch adult outdoor play-land is located at the MGM Grand pool area. Features saltwater pools, intimate dipping pools, and multiple bars to quench you thirst, this “Pinnacle of Pool Parties” is the place to be during the summer. Just above the DJ booth lies a huge LED display airing top-tier lighting and special effects productions to complement the unrivaled DJ list. Music at any pool party is step one, and Wet Republic has answered the call, bringing you some of the worlds most talented DJs. With a partnership with MGM Grand, Hakkasan Group, Wet Republic has developed a DJ line up that rivals the biggest and best nightclubs & pool parties in the world. 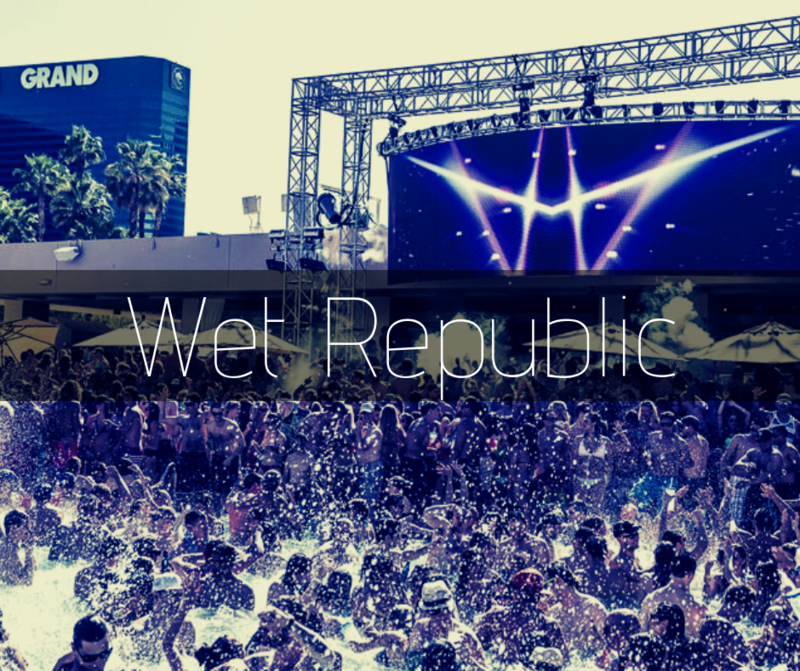 With exclusive residencies from DJs like Tiesto, Steve Aoki, Calvin Harris, Hardwell, Zedd, Nervo and many more it’s easy to see why Wet Republic is one of the best pool parties in Las Vegas. With a variety of Table Reservation options including Daybeds, a variety of Table locations, Party Cabanas, Deluxe Cabanas, and coveted Bungalows, Wet Republic aims to please. Premium bottles, made-to-order premium cocktails, and a varies of delicious food items can be enjoyed at your reserved spot. Wet Republic pool access is granted to those with Sunbathing/Swim attire. People without proper swim attire will not be allowed to enter pool areas. European bathing is not permitted. Important: All entry to Wet Republic is based on management’s discretion. Any person who refuses to comply with any regulation governing public bathing or swimming facility or any rule of that facility must be excluded from the premises.